I know Mother's Day is Sunday. 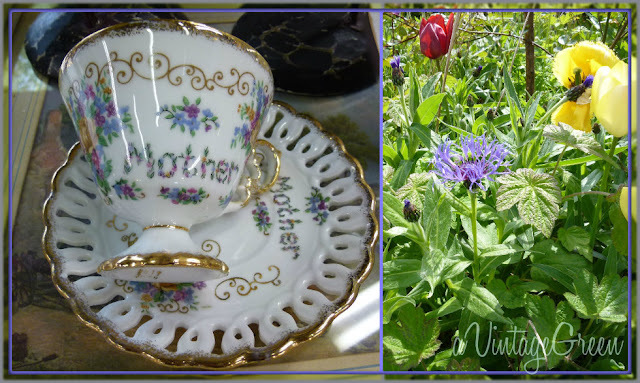 This pretty teacup and saucer came my way this weekend and the garden flowers were blooming, peonies were getting fatter, sweet peas are mostly planted and I thought I would share a bit. 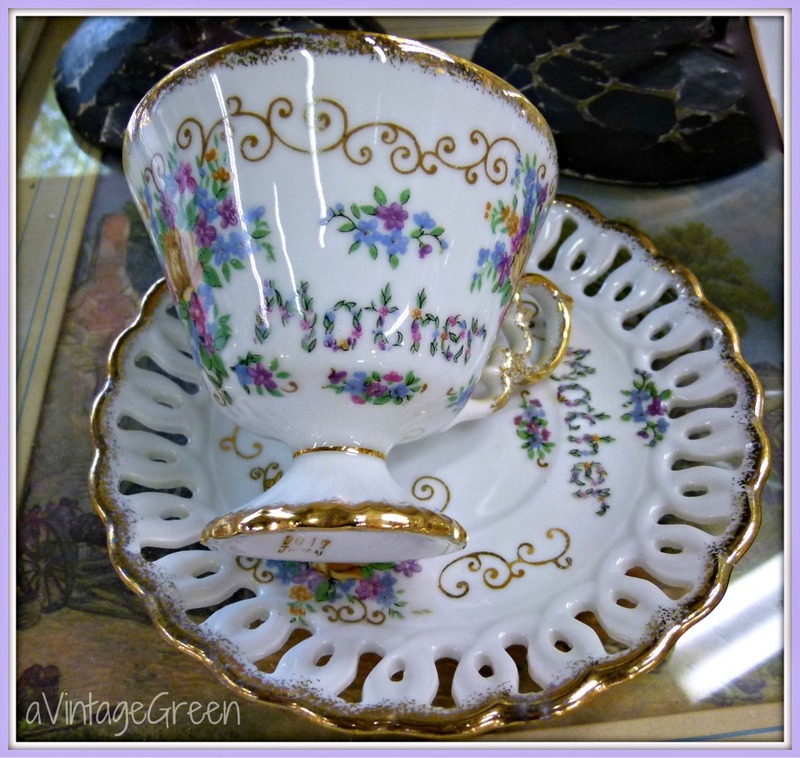 I framed the cup and saucer in PicMonkey. The rest of the pictures are collages made with iPiccy. 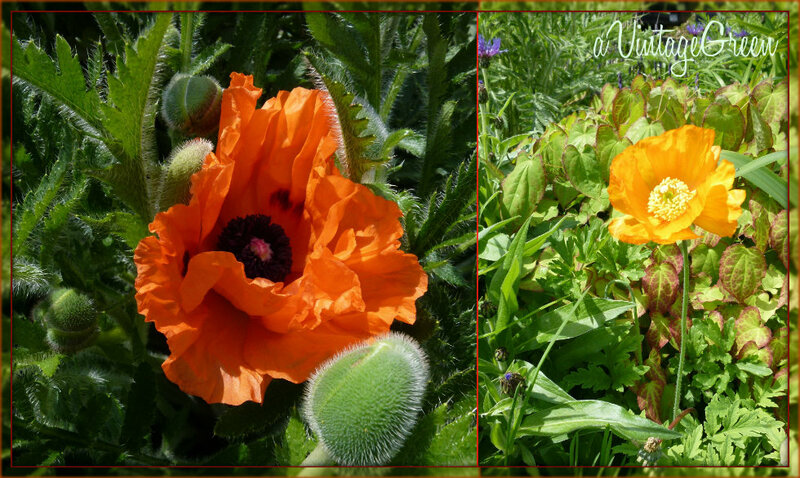 First oriental poppy blossom of the year and first poppy of the year. Today I dug out weeds in the small blueberry bed and planted sweet pea plants as well as sweet pea seeds. Tomorrow I will add green peas to the mix. They are soaking right now. They grow well together on the same supports. 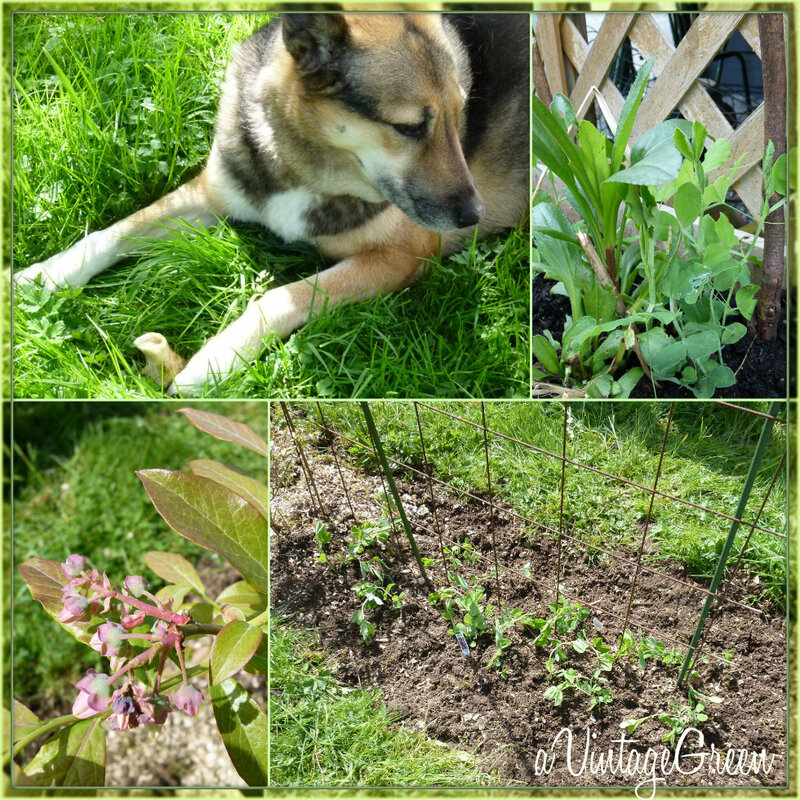 Peaches found the bone she has been working on and DGS carefully weeded vine weed from the peonies and tulips. He has very good hands and eyes for weeding and we have many discussions about bugs, little white egg clusters and earthworms and what is and isn't a weed while we are working. 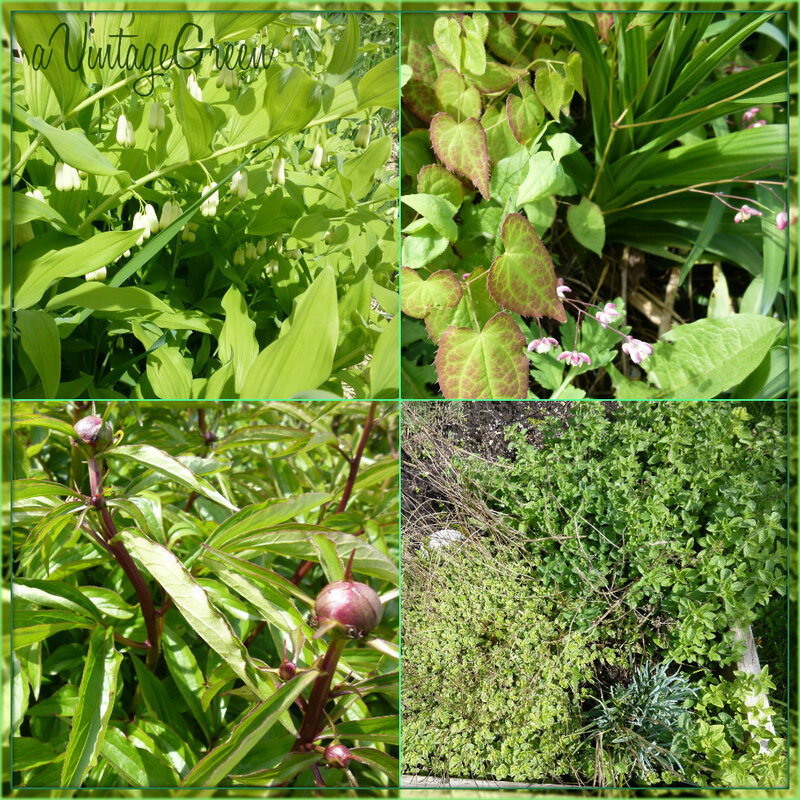 This grouping is lily of the valley (I think, they are very large plants), bleeding hearts (I think), peony and various herbs. I think I can see ants on that peony. I am going out to see if I need to spray with something natural. My garden areas are small and right now very full of weeds and dandelions and grass with roots that grow deep and wide. You would be (well, I am anyway) amazed at the sheer volume of chick weed, dandelions, buttercups, rogue grass and much more that needs to be removed from the garden beds. Hope DS picks up the lawnmower tomorrow (in for a full tune up) so the grass can be tidied. I think I will have another session with the weedeater, no rain is scheduled for the next few days. Joy, that teacup and saucer are lovely. I also enjoyed the other photos. Our Peony plants are coming along nicely, too. I love the flowers! The ants aren't really doing any harm to the Peony, they just milk the sweet sap that comes out of the leaves....don't harm them, they do good also. I love your header, and especially the photo of the Salter scale...I remember seeing one at the antiques mall years ago, and ever since I have kicked myself for not buying it..it was around $65 and it was a little too dear for me then. I miss the Antiques mall, it's a long drive now. We got some much needed "soaking rain" last night. Along with the beauty of flowers come those pesty weeds. What a lovely post! Your new teacup and saucer are so pretty and your gardens look great! Peaches is so adorable - a german shepard? My Lily-of-the-Valley should be in bloom this week if it ever stops raining. What a lovely teacup and saucer you have, so pretty with the blue flowers. Your poppies are wonderful! Also, I just noticed the old suitcase in your topper - good use of 'newspaper.' Everytime I see your header I'm inspired (and entertained). pictures of your garden make me so happy. Thanks for sharing. I wish I would take time to get my garden going. Problem with a right hand is slowing me down. Love the cup too. Happy Mother's Day. What a sweet tea cup and your garden is lovely! I so enjoyed my visit. Thank you! A perfect combination for a nice Mother's Day. Beautiful garden! And your teacup reminds me of one my mom had when I was young. Thanks for sharing! Look at all of the beautiful things you have growing! And the cup and saucer is charming! Such a sweet tea cup! Peaches is adorable and what a lovely yard she has to enjoy her bone! 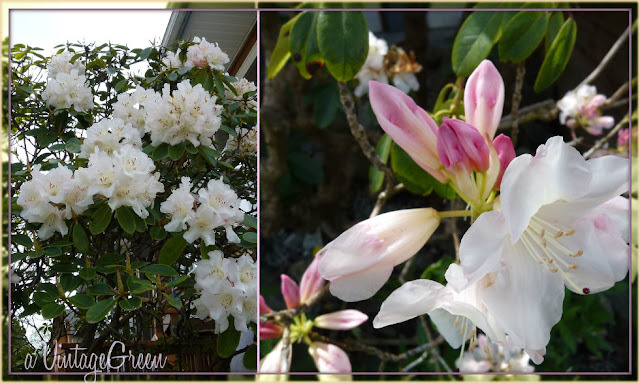 Beautiful Flowers, love them all! I love that teacup and soccer! !